Whitevale resident Rob Quiq spoke on-air this morning about the need for a pedestrian bridge in Whitevale. Right click the link below and select “save link as” to download the interview. Letter from Joe Dickson regarding possible pedestrian bridge in Whitevale. 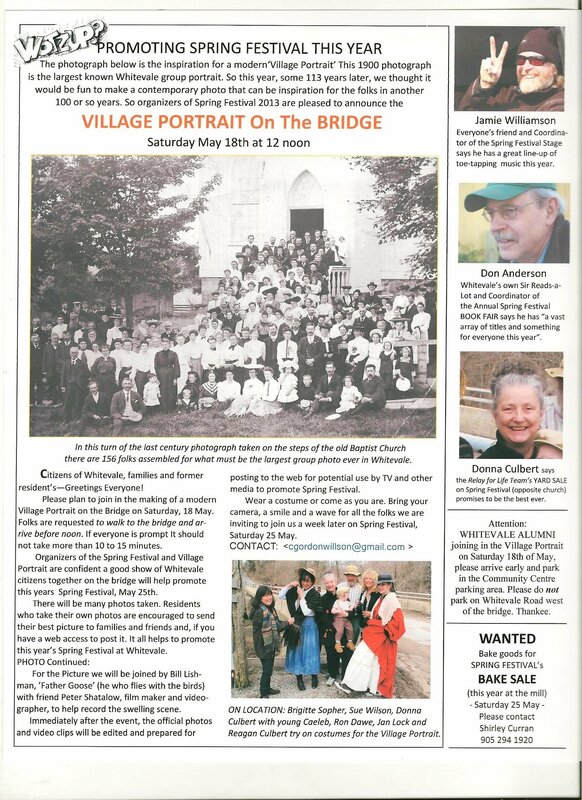 Please join us on the bridge – May 18 at noon for the portrait. See the attached image below for more details. The Whitevale Bridge is in the detailed design phase and is scheduled to be replaced during the summer of 2013. A. Do Nothing – no change to the bridge or current operation of the road. B. Restrictive Signing/Traffic Diversion – re-direct traffic to adjoining roads and restrict loads on bridge. D. Bridge Replacement 1 Lane – replacement of the two lane bridge with a one lane structure. E. Bridge Replacement 2 Lanes – replacement of the two lane bridge with a new two lane structure.